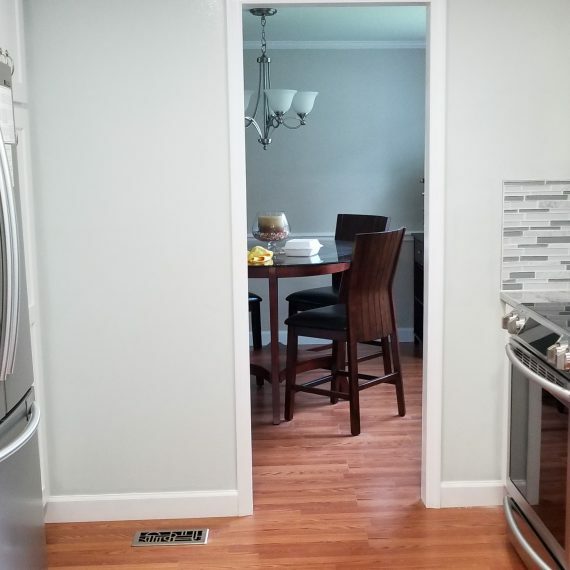 This particular project started with a kitchen install which included the complete removal of the floor as well. 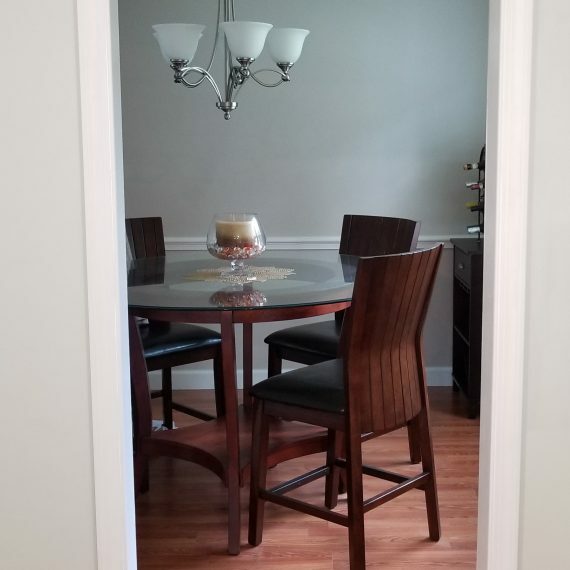 At a later date the dining room as well as the living room were added for renovation followed by the renovation of bathrooms, powder room, family room, bedrooms, garage, and the patio. 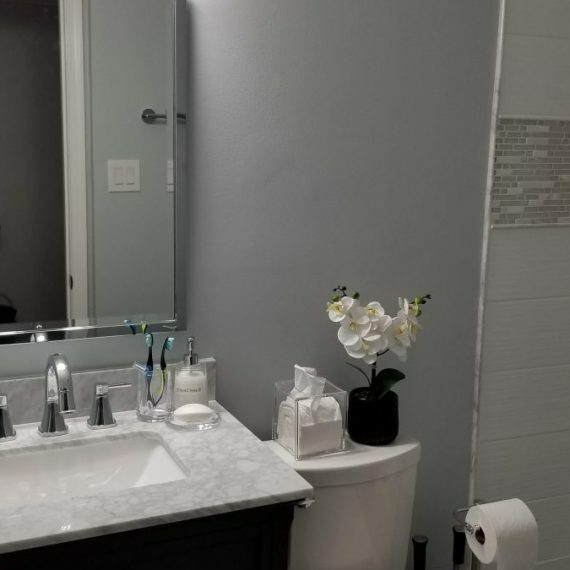 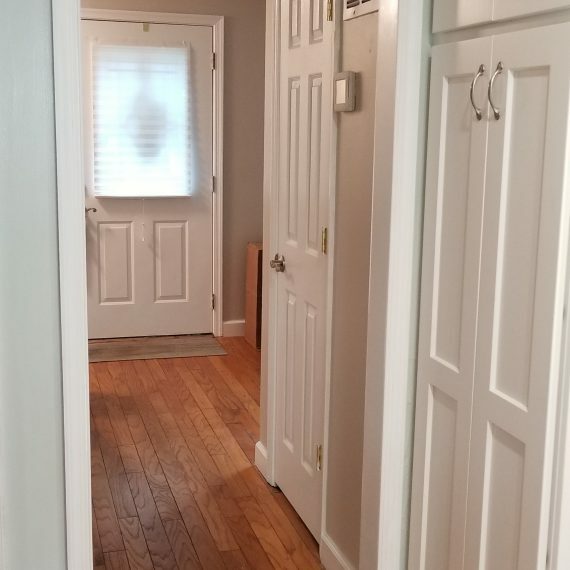 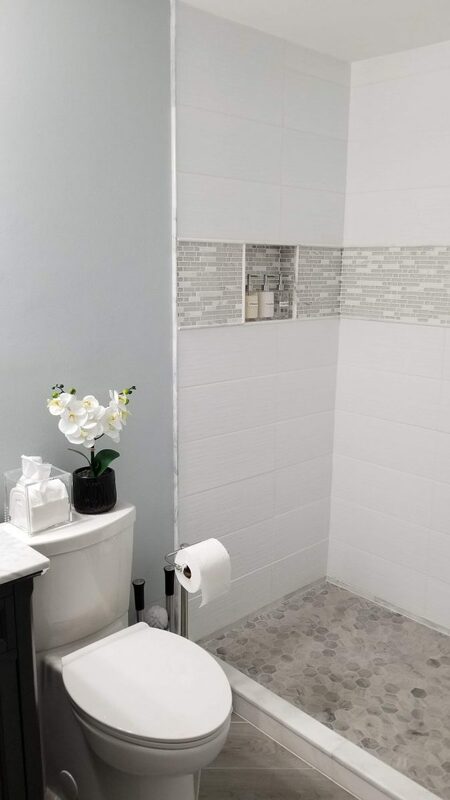 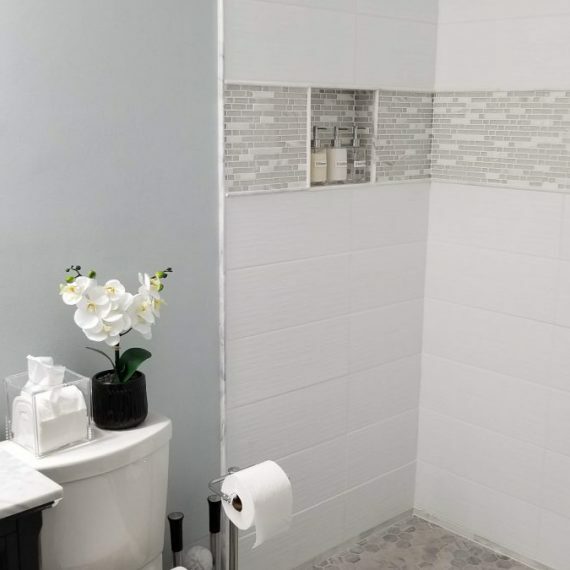 Every room’s carpet as well as the hallway carpet was replaced with hardwood flooring, new baseboards, crown molding in selected rooms, new electrical outlets, ceiling and walls painted. 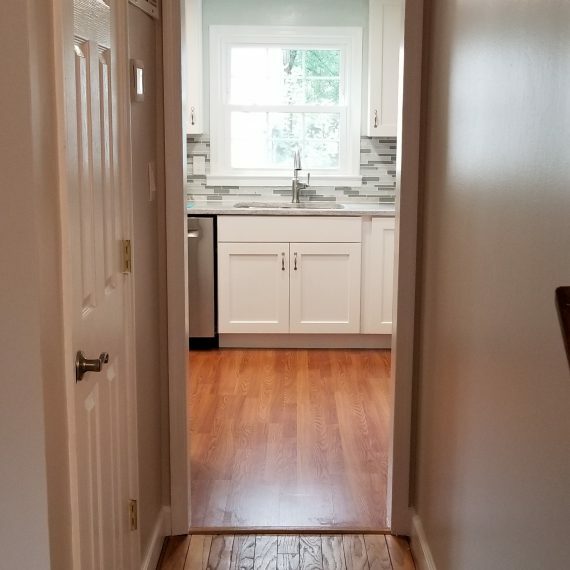 New kitchen cabinets replaced the existing cabinets, hardwood floor was installed before the kitchen cabinets were hung. 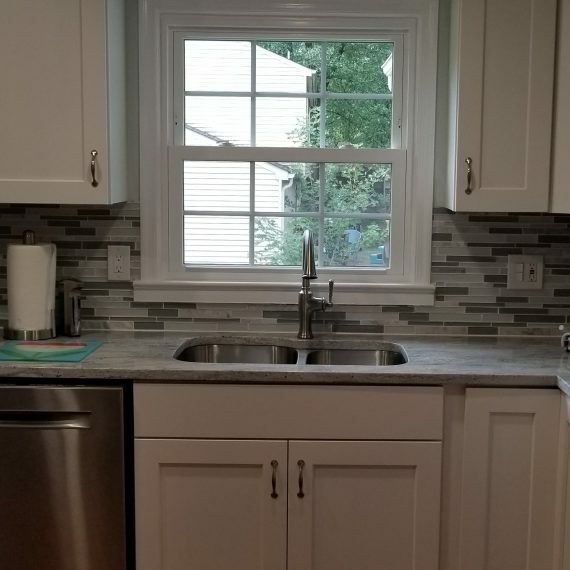 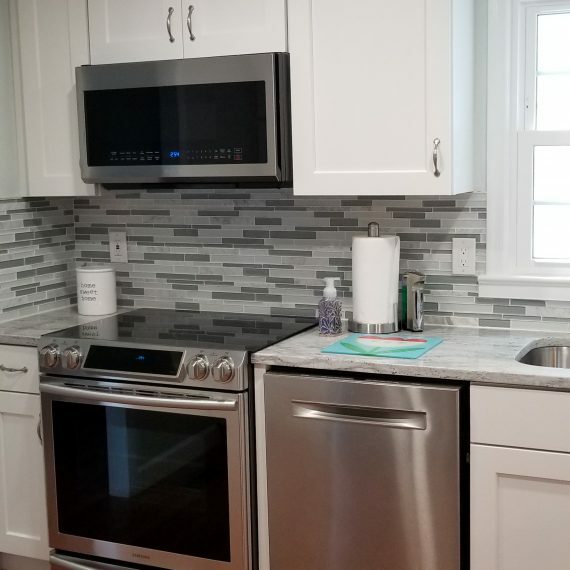 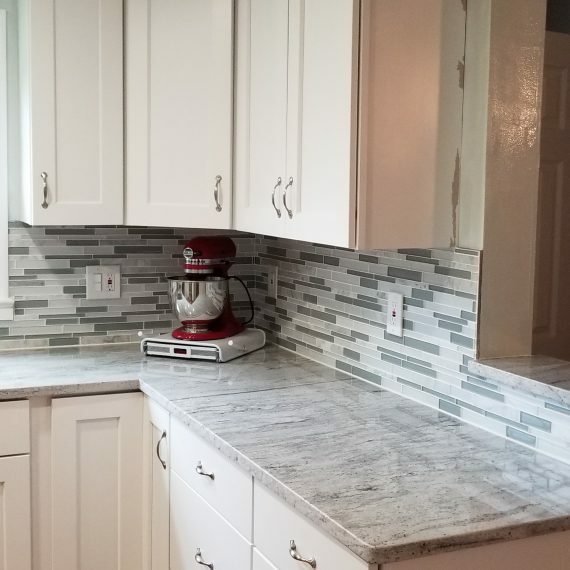 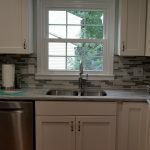 A tile back splash was added after the new counter top was installed. 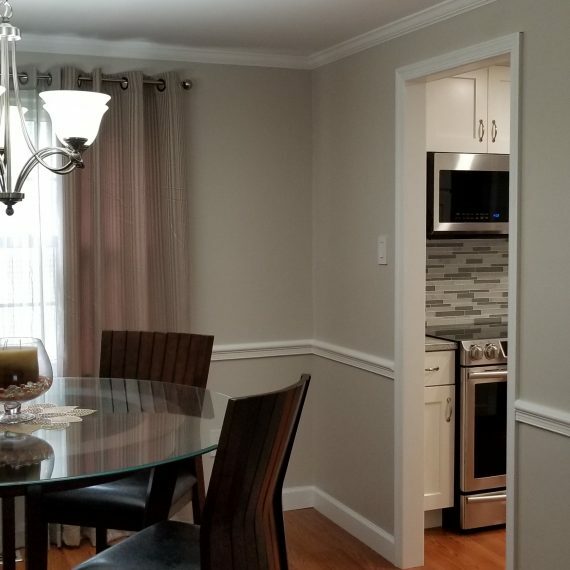 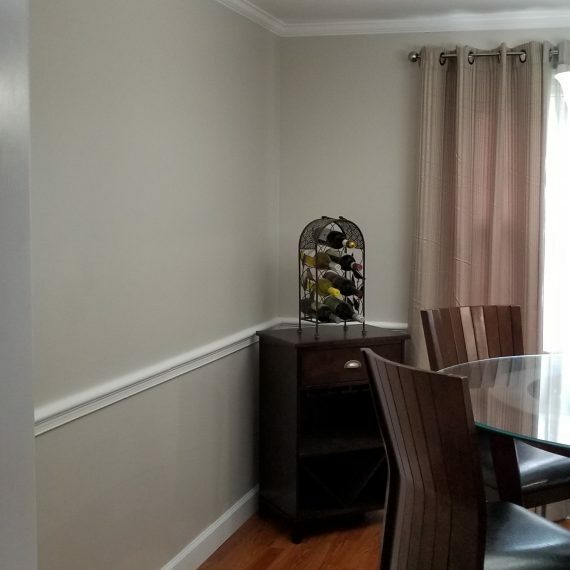 The dining room was striped of the existing wall paper, hardwood flooring was installed and new baseboards added. 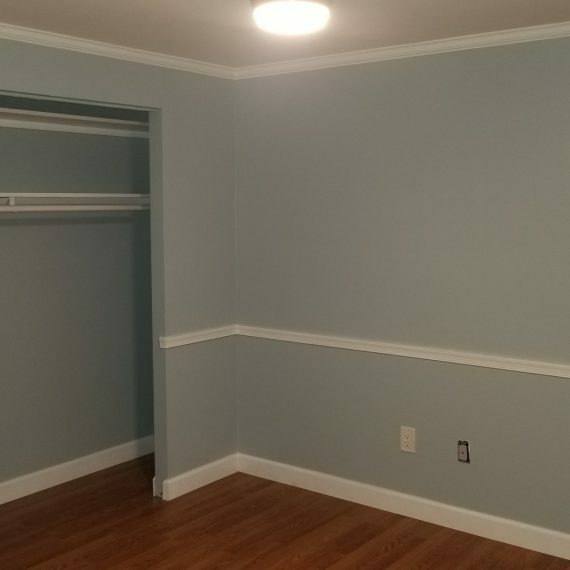 The walls received a new coat of paint. 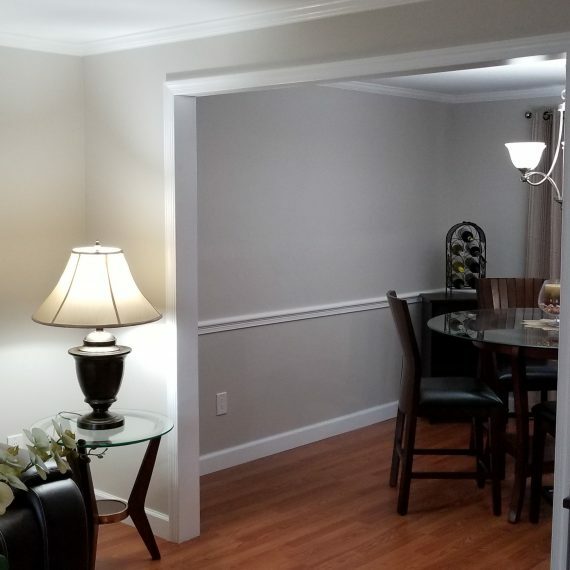 To create a continues look, the hardwood floor was also used in the living room, new baseboards, and the framing of the thru way to the dining area gave the living room a new look. 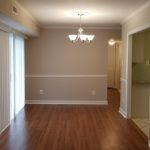 Engineered hardwood flooring replaced the existing carpet, the ceiling and the walls received a new coat of paint, new baseboards were installed. 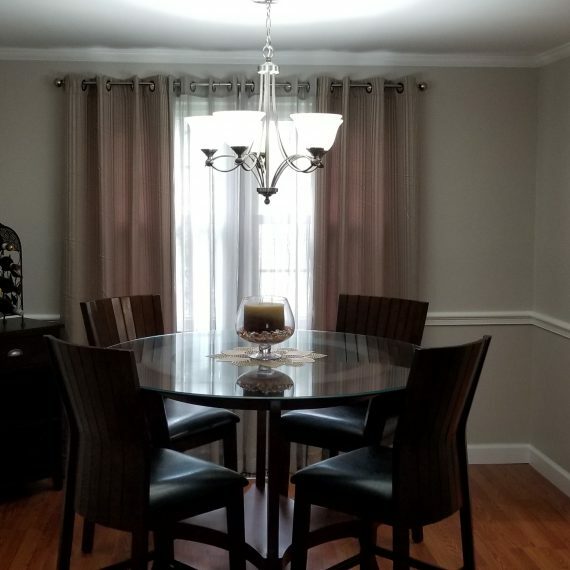 New light fixtures added a up to date look. 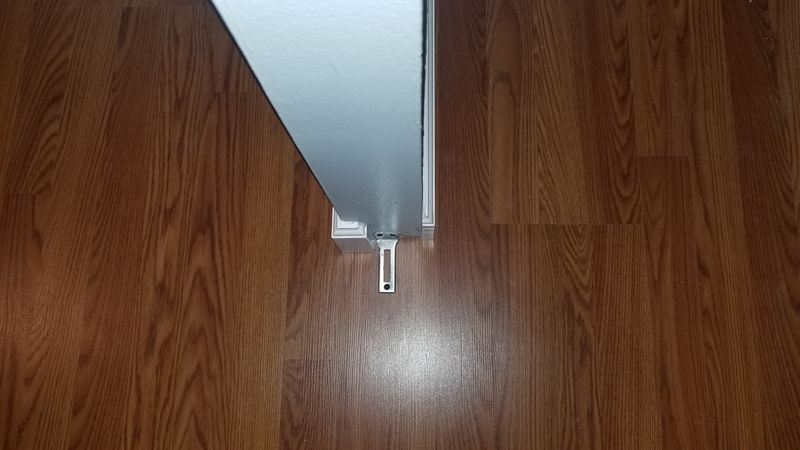 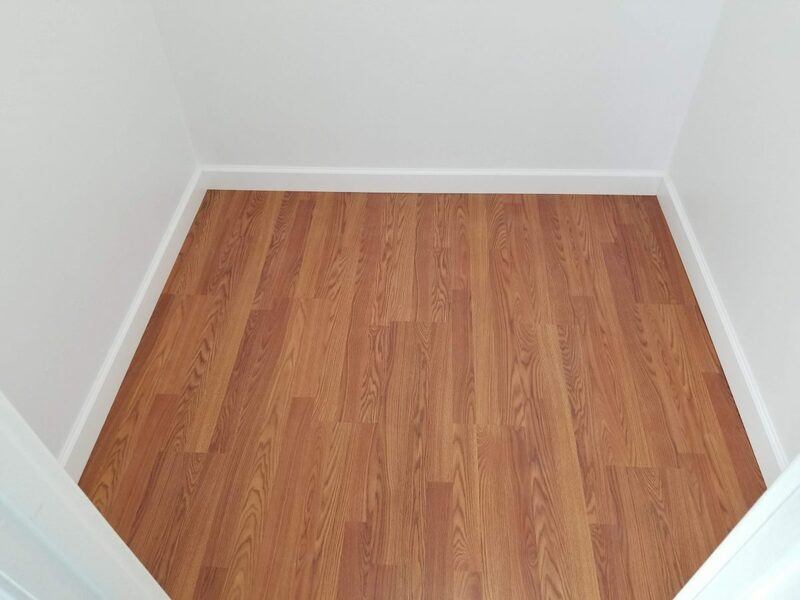 The existing carpet was removed, snap engineered hardwood flooring was installed, and new baseboards were added. 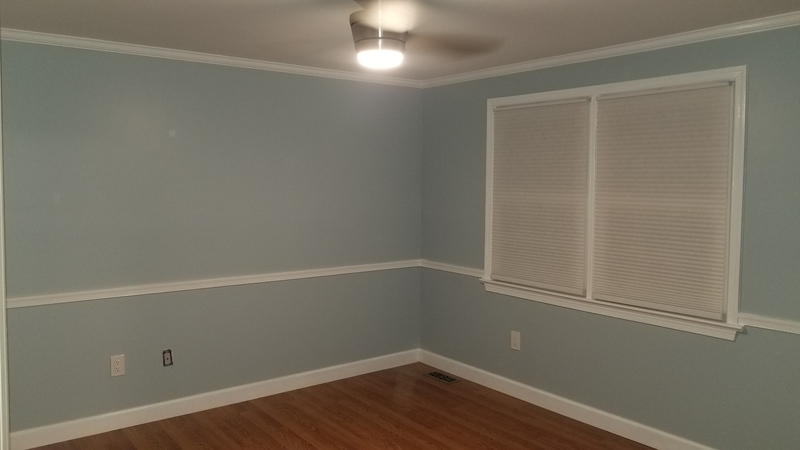 New paint was applied to the ceiling, the existing trim, and the walls. 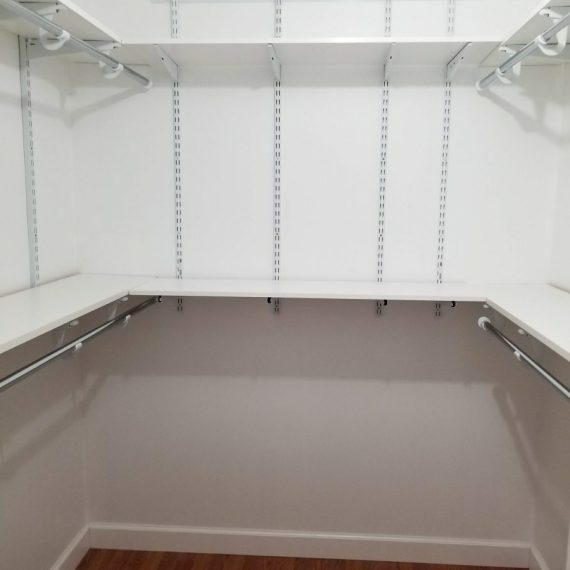 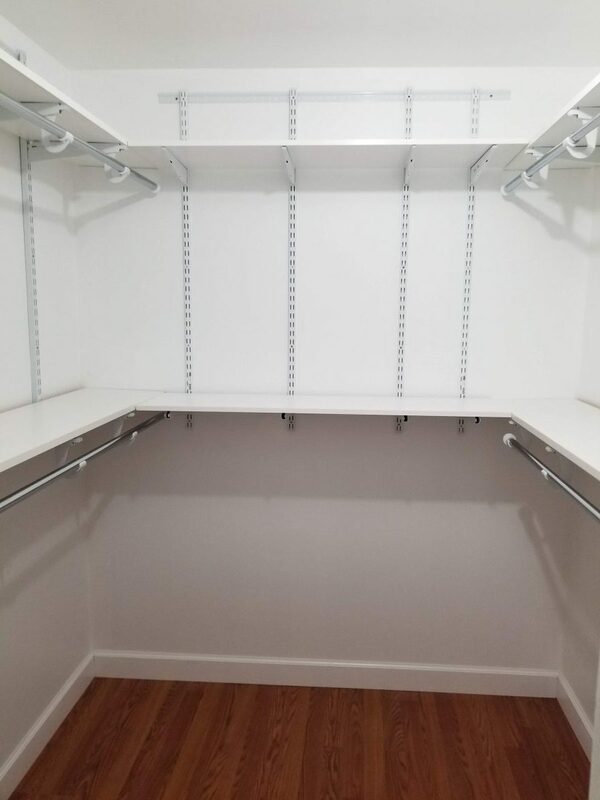 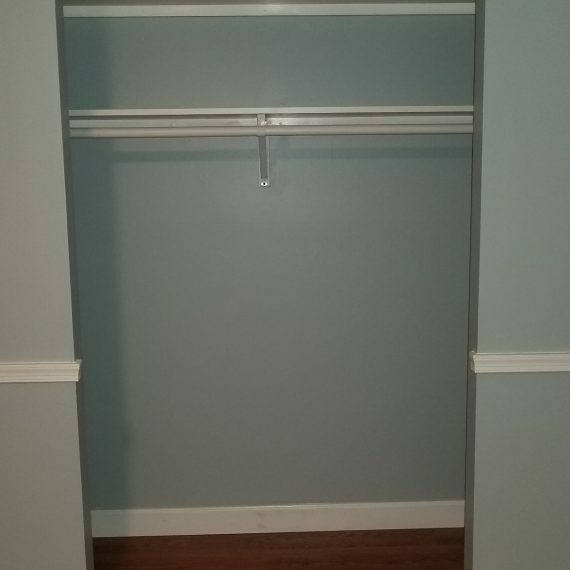 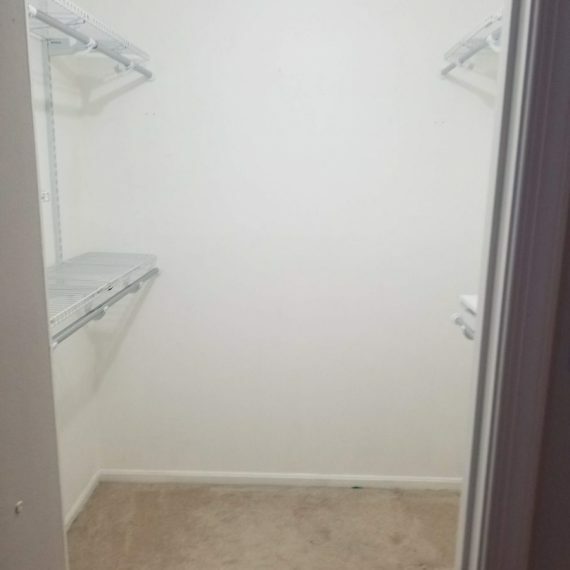 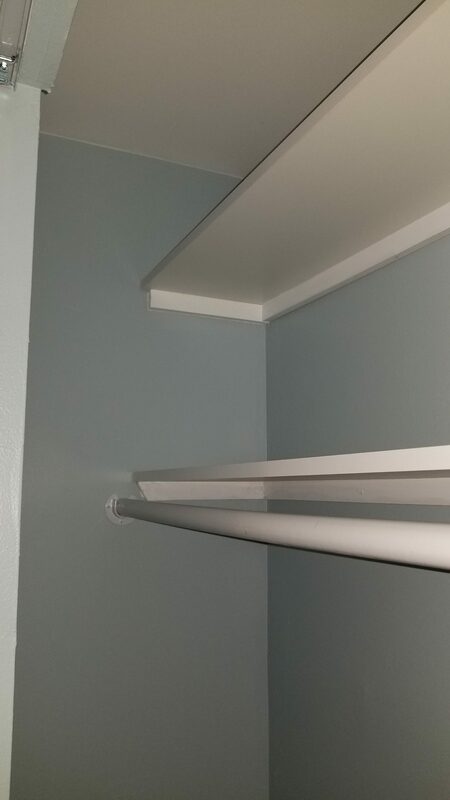 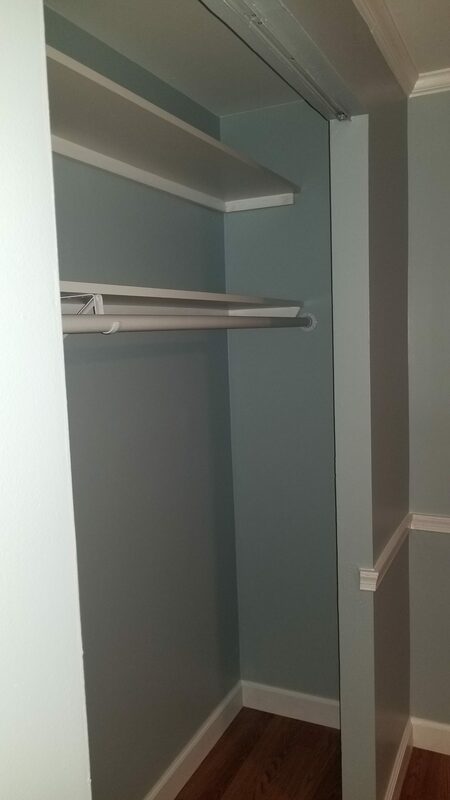 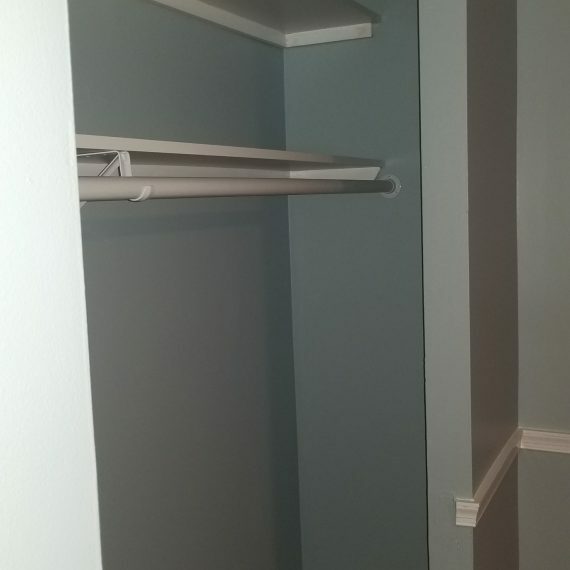 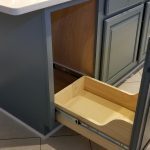 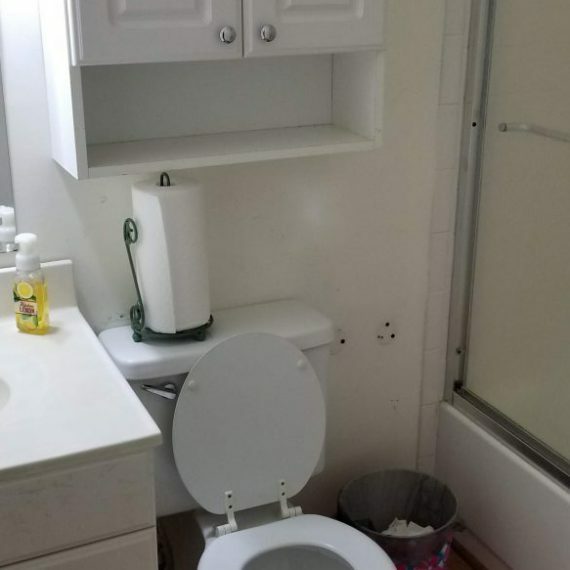 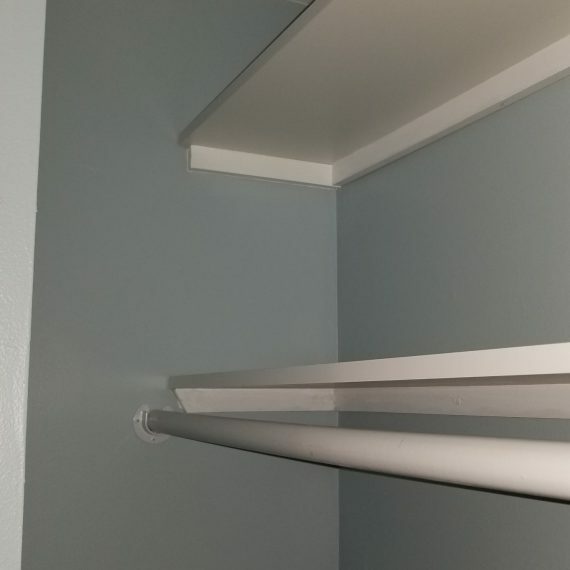 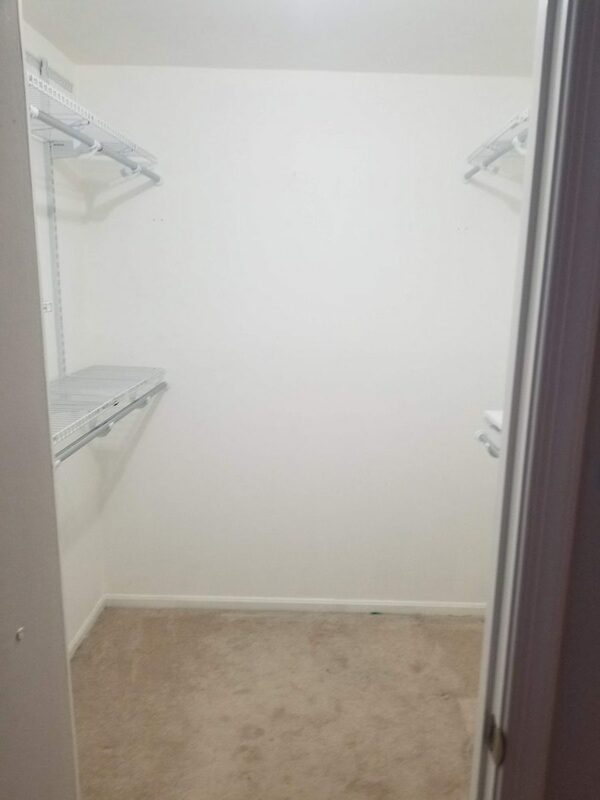 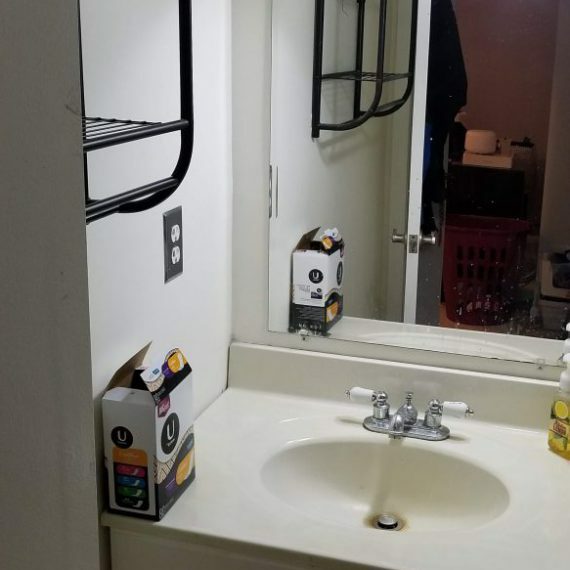 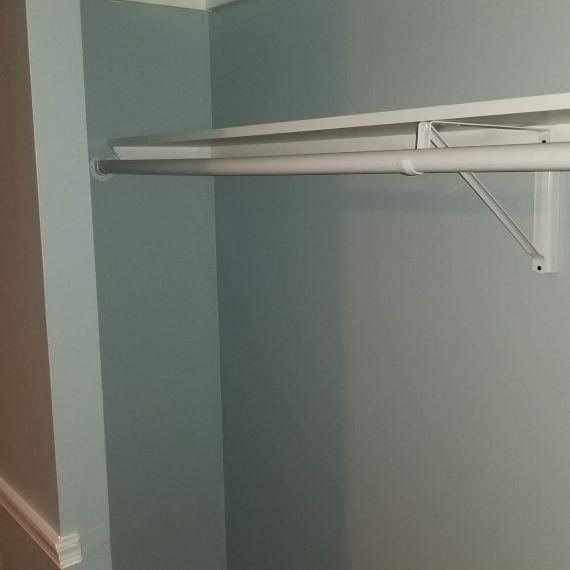 The closet organizer was replaced with two wall to wall shelves and a rod. 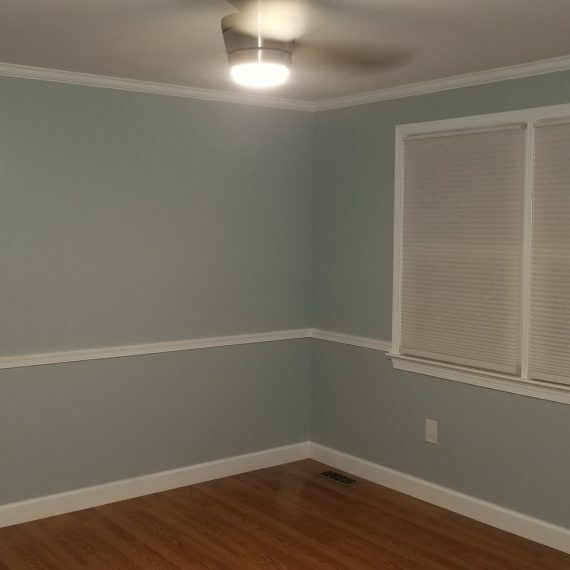 A new ceiling fan and translucent blinds added a finishing touch to the room. 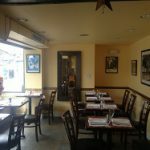 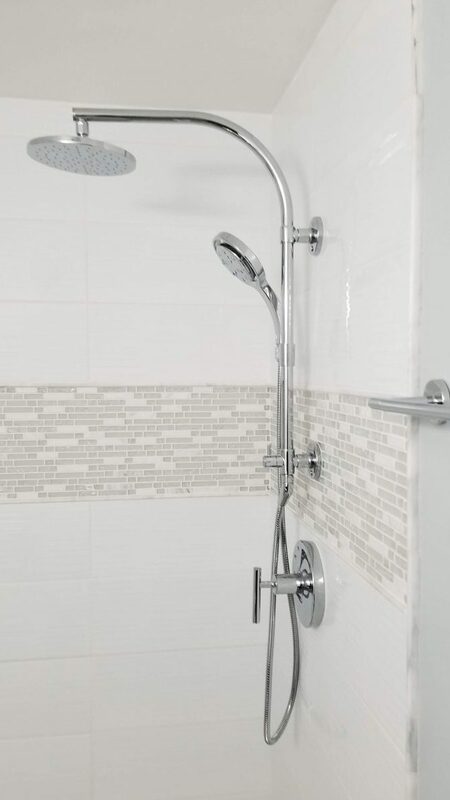 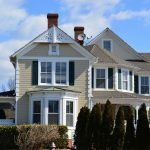 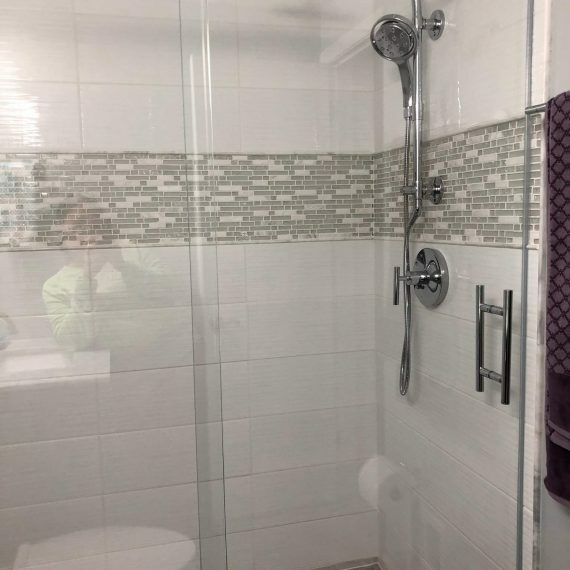 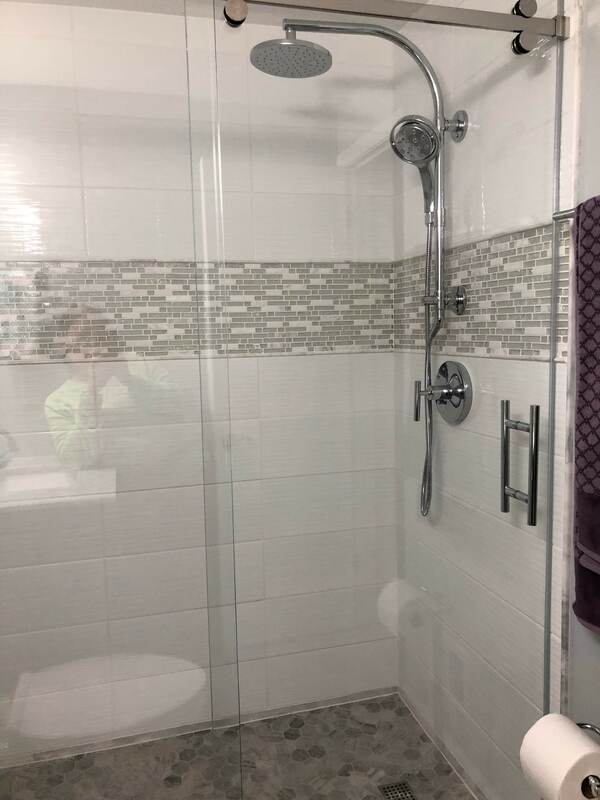 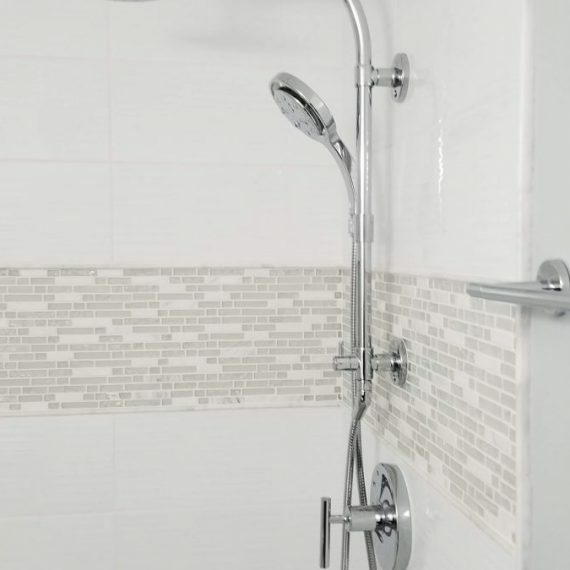 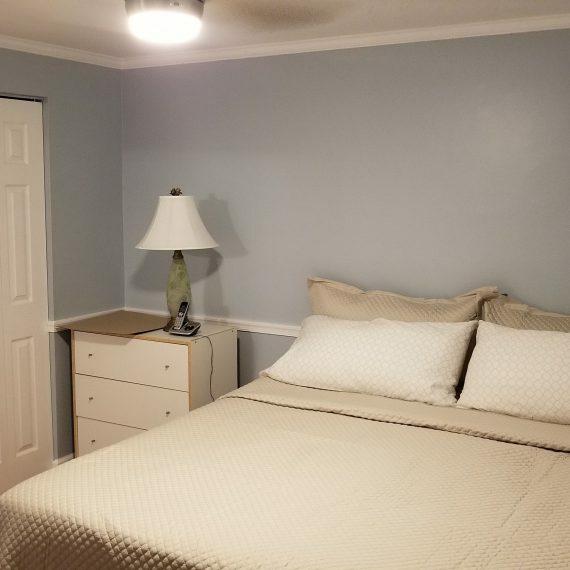 Until the complete renovation a new coat of paint was applied and new fixtures installed to spruce up the existing look. 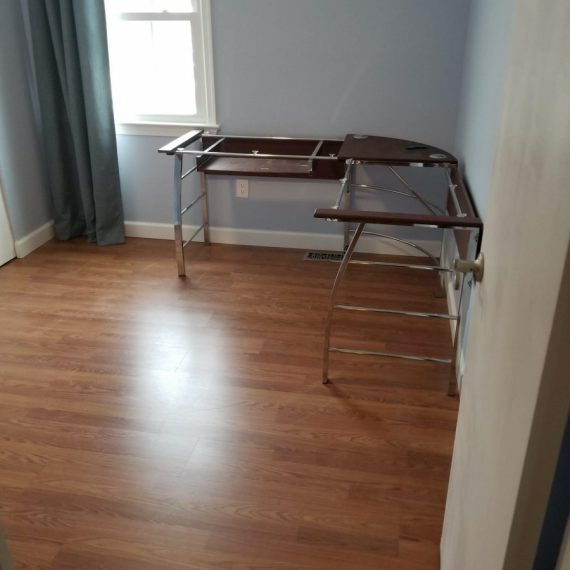 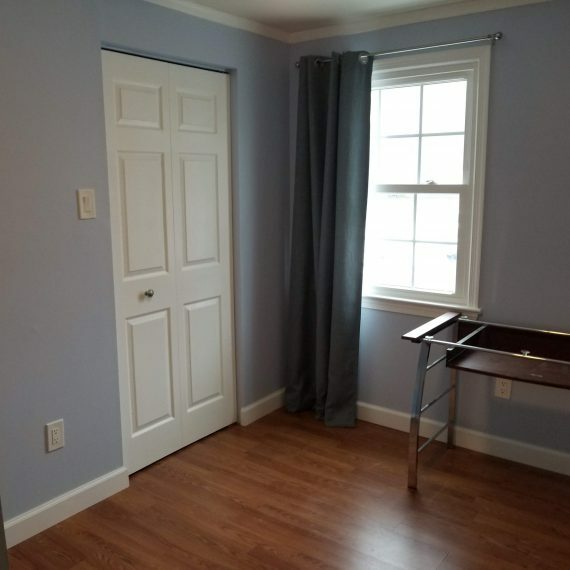 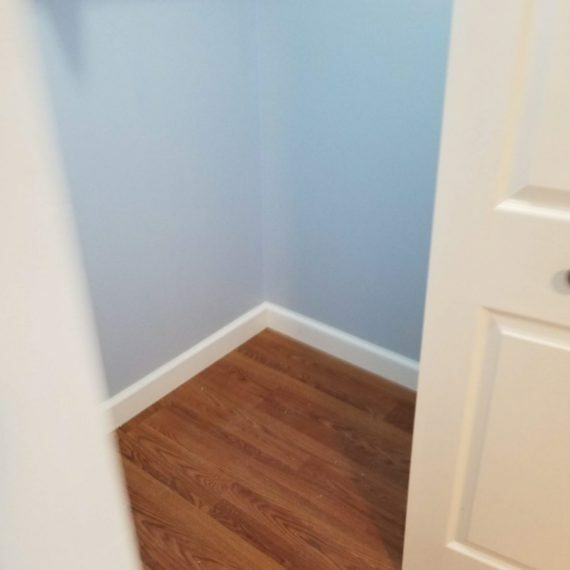 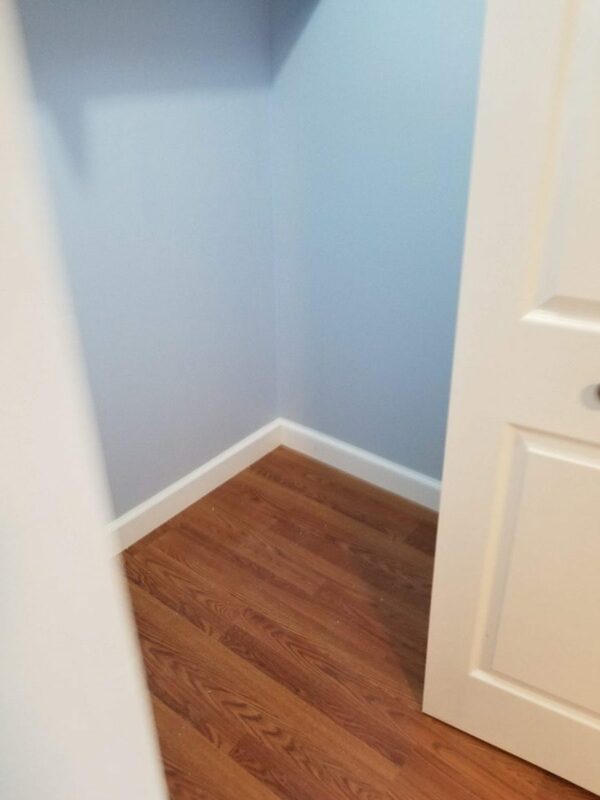 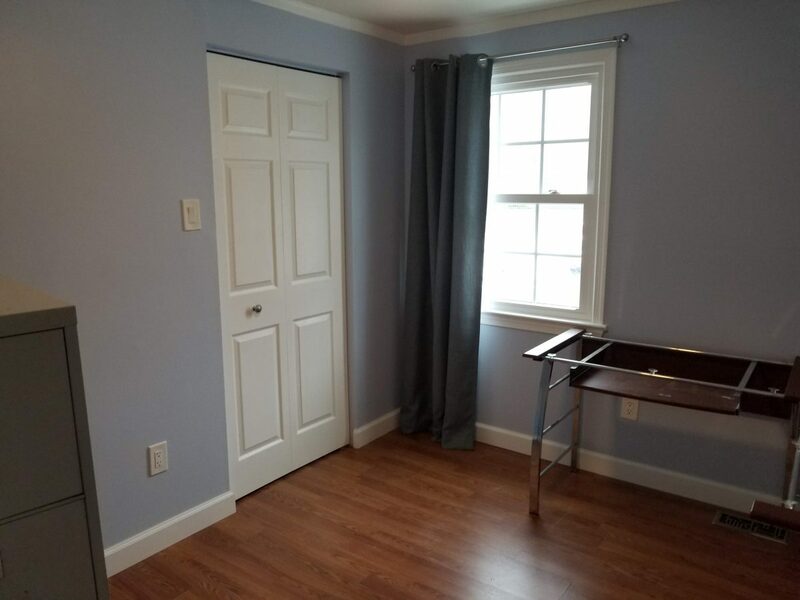 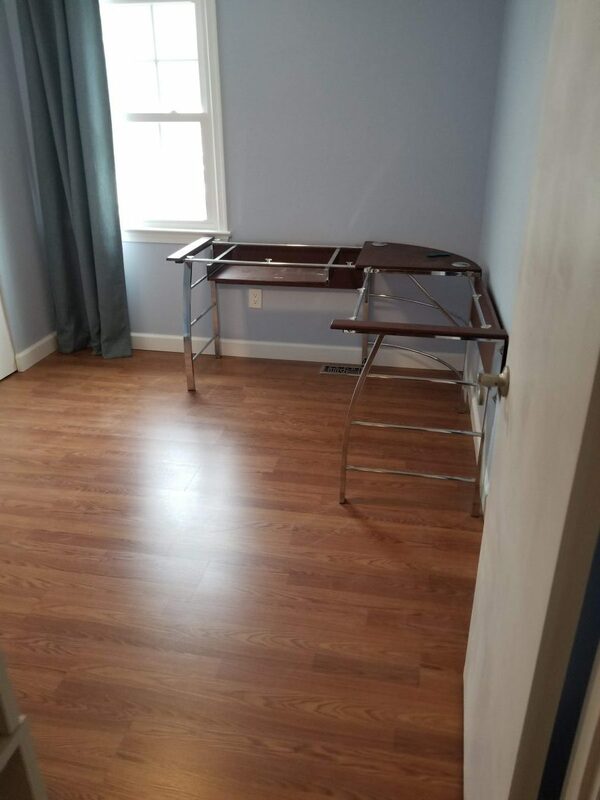 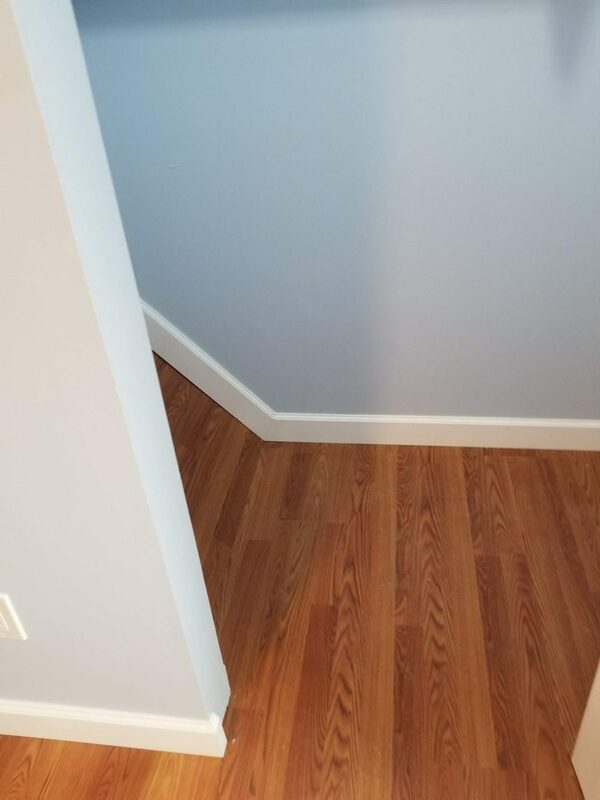 As with the guest bedroom the carpeted flooring was replaced with hardwood floor to provide a consistent look and feel for the second floor. 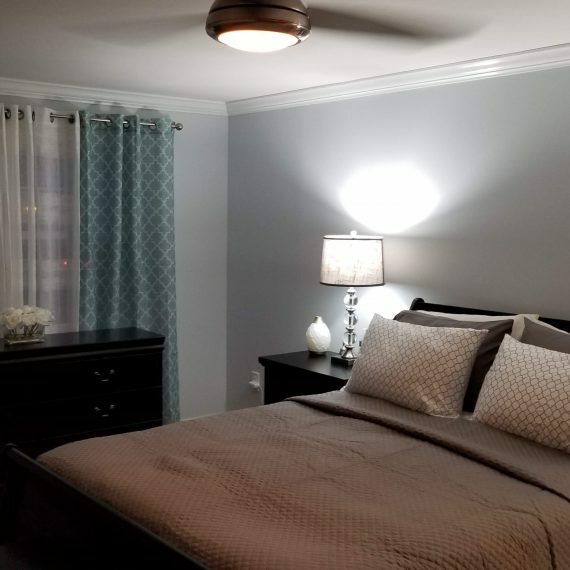 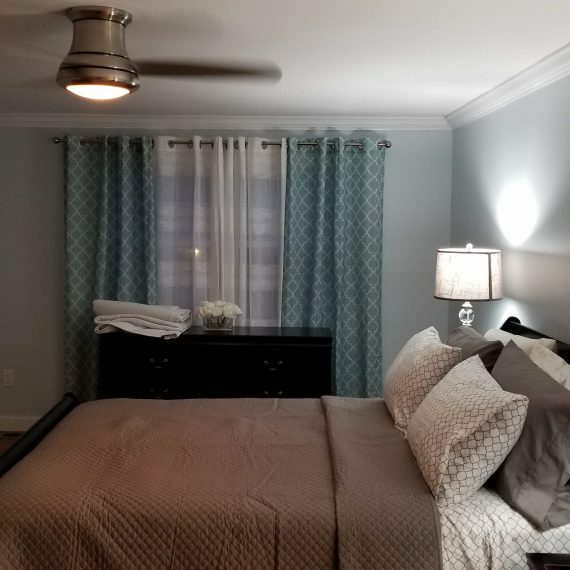 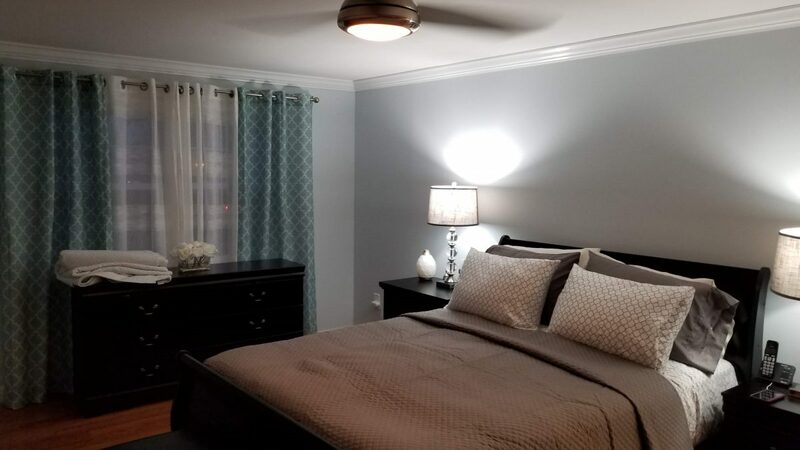 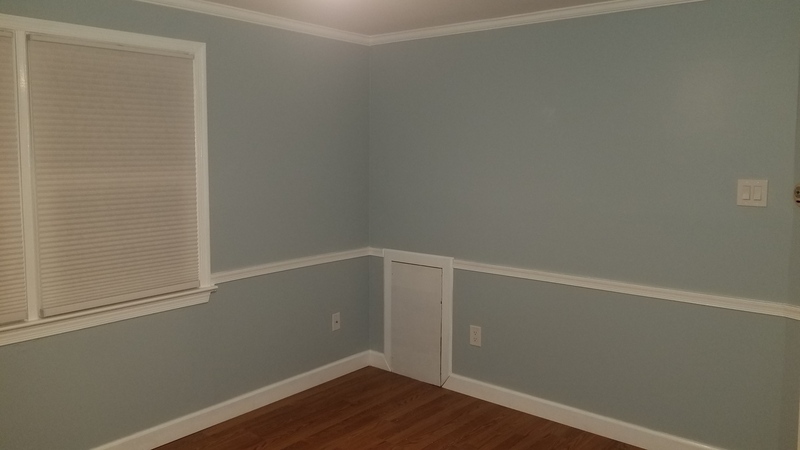 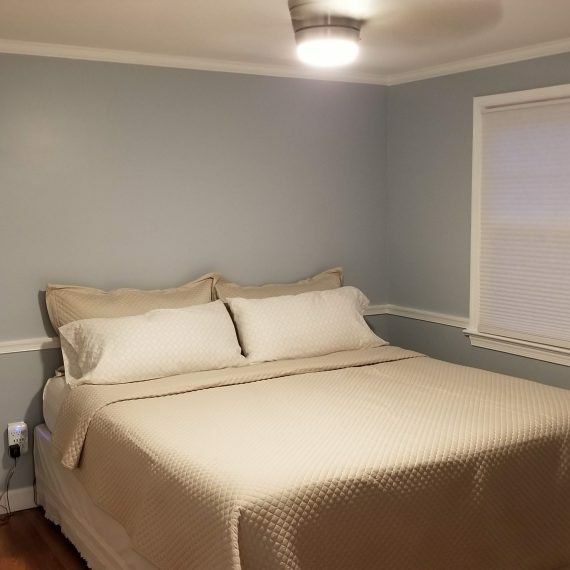 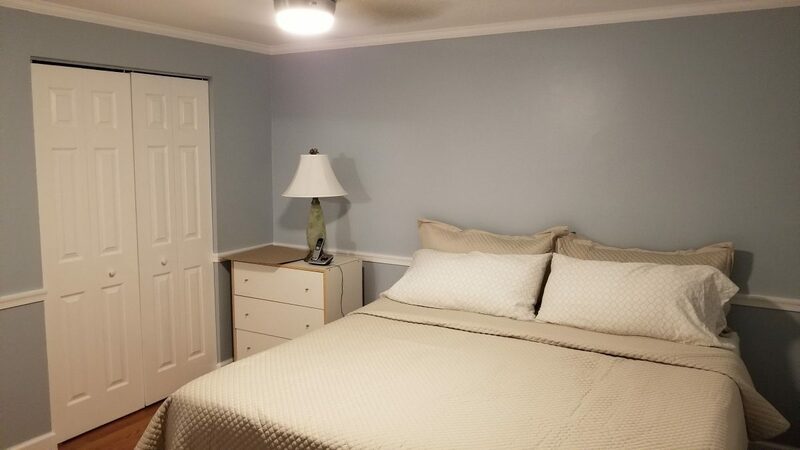 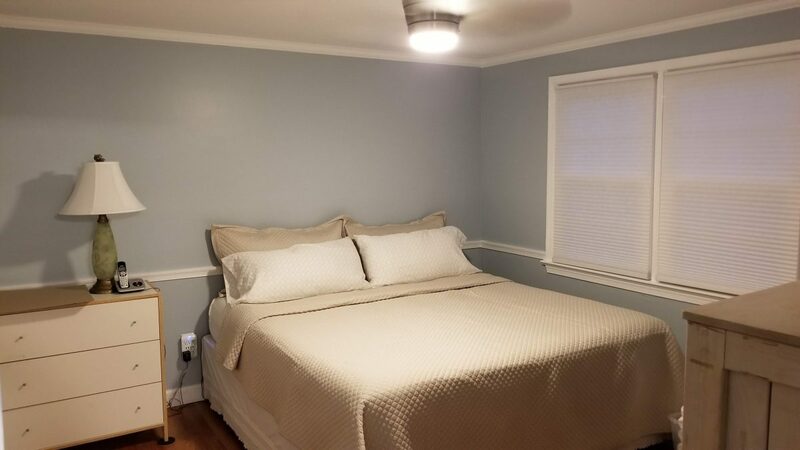 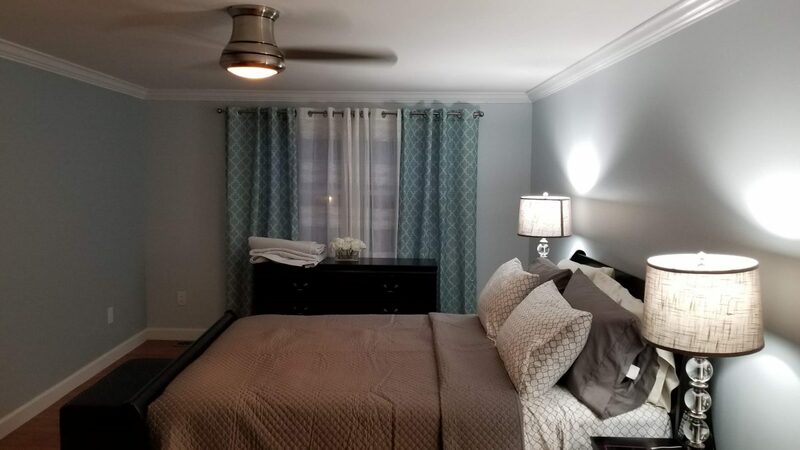 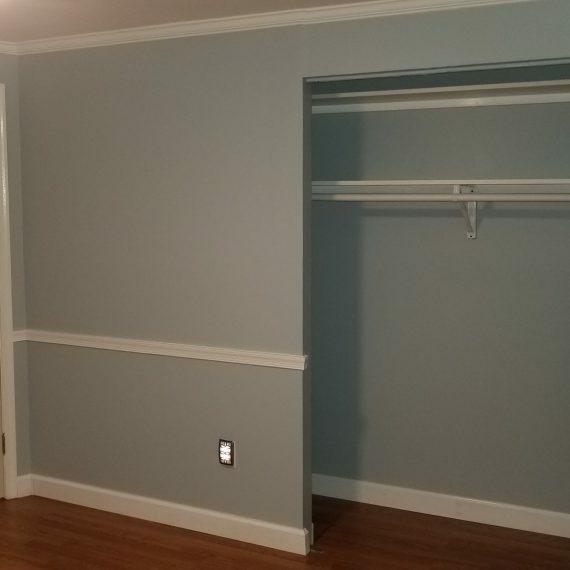 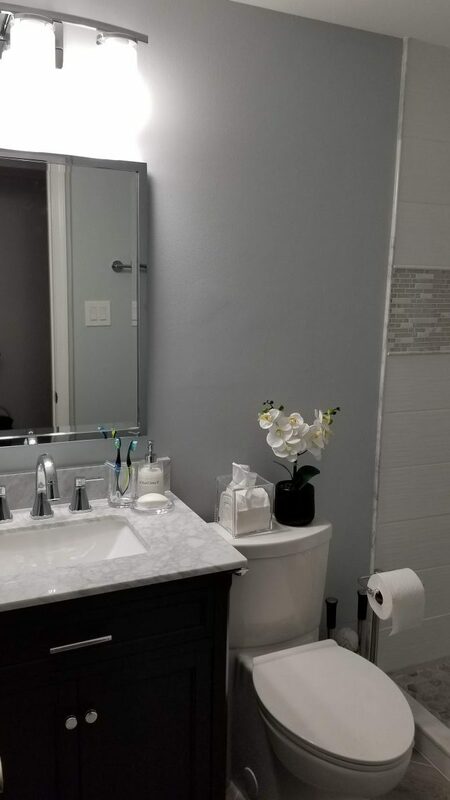 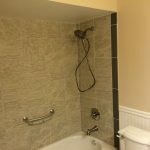 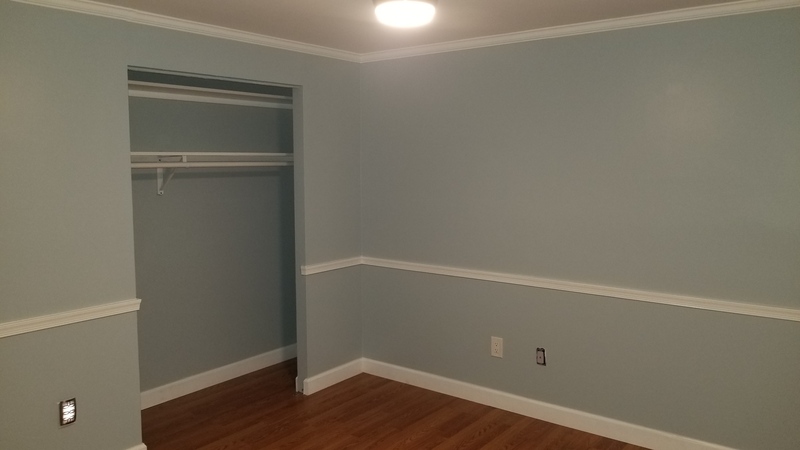 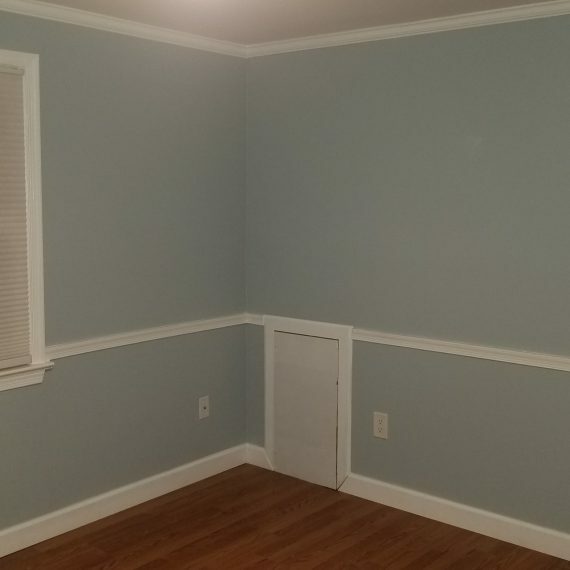 In addition, new baseboards, crown molding, and a new ceiling fan were added, and, of course, the bedroom walls were painted to create a new look. 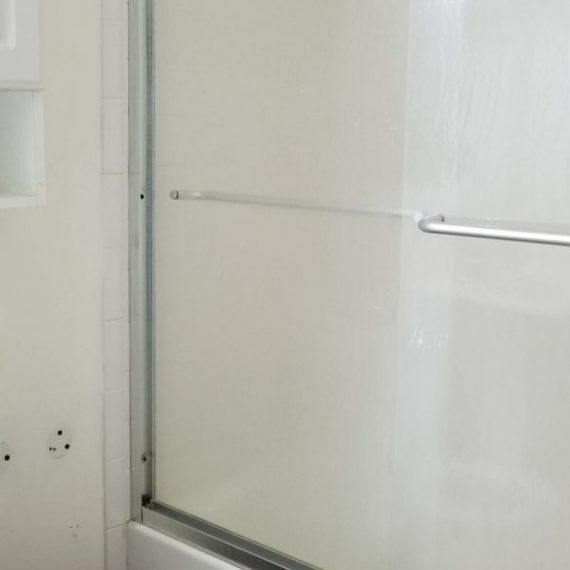 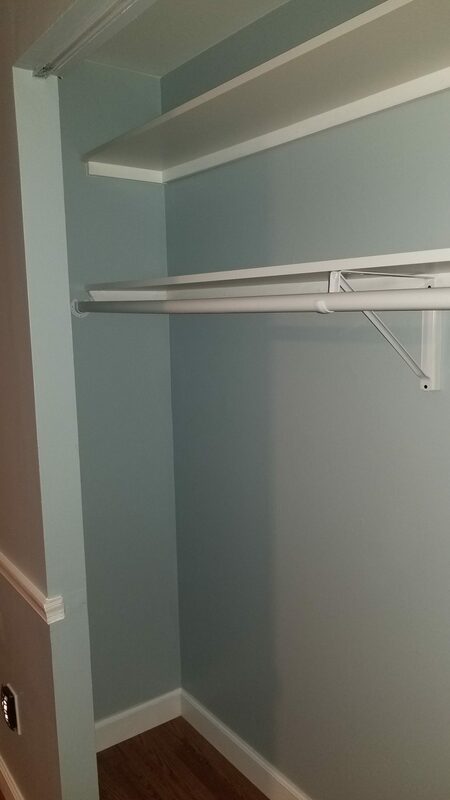 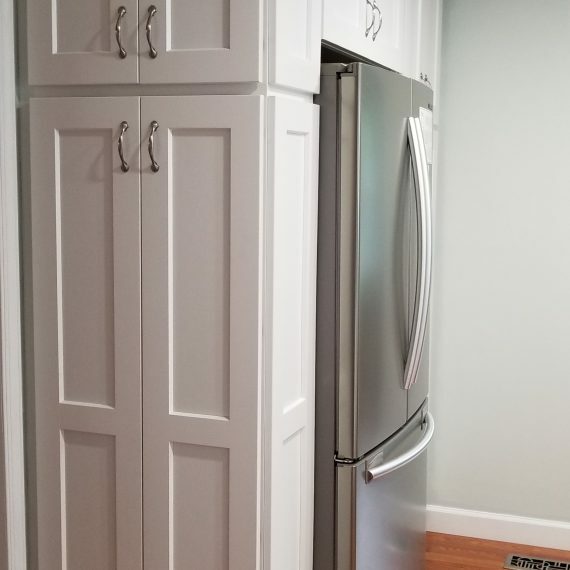 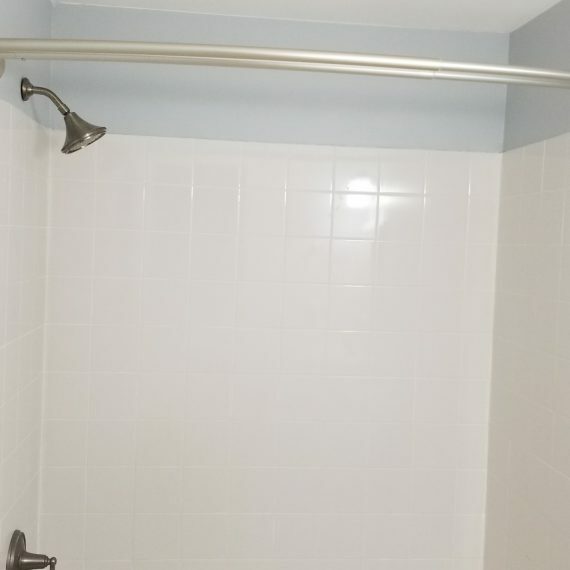 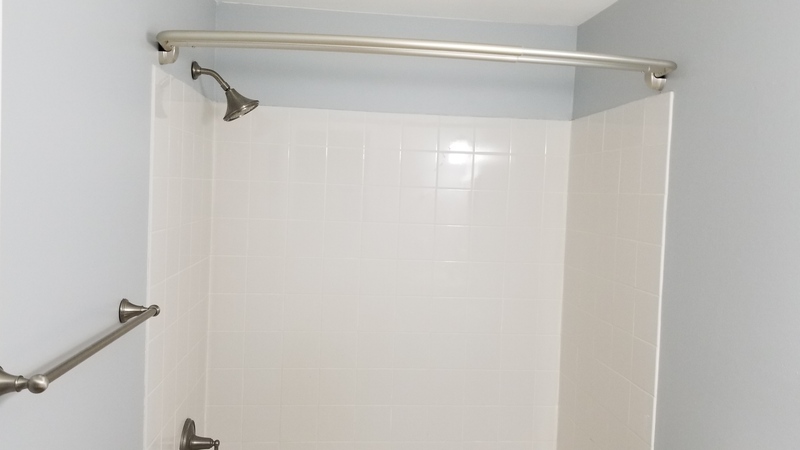 Since the walk-in closet’s walls were facing towards the outside they had to be re-insulated. 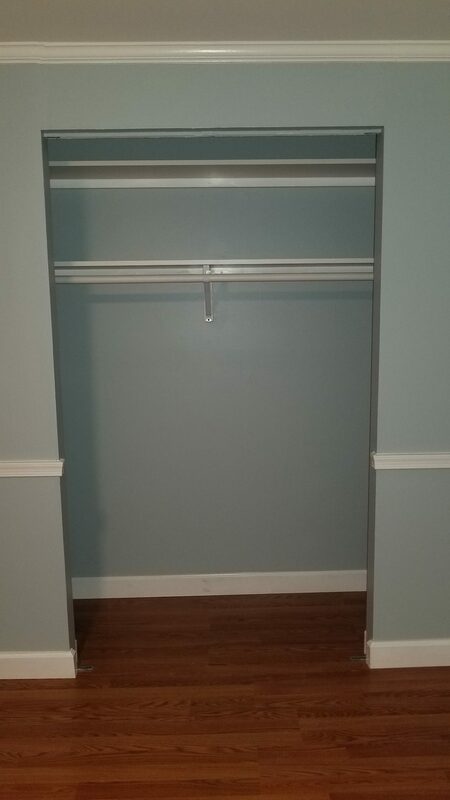 New drywall, paint, flooring, baseboards, and a new organizer completed the closet. 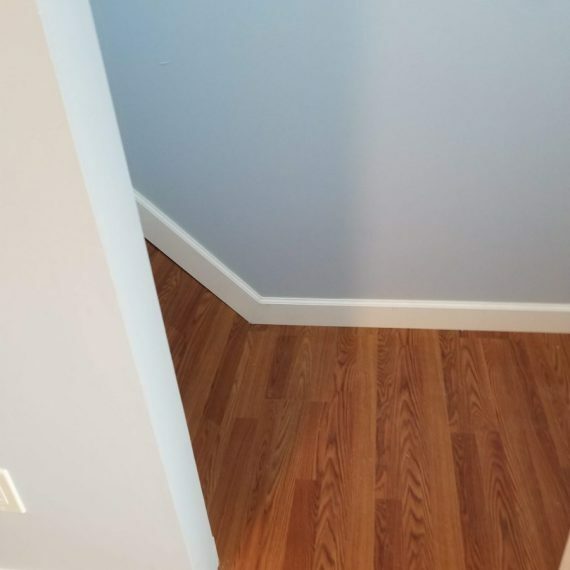 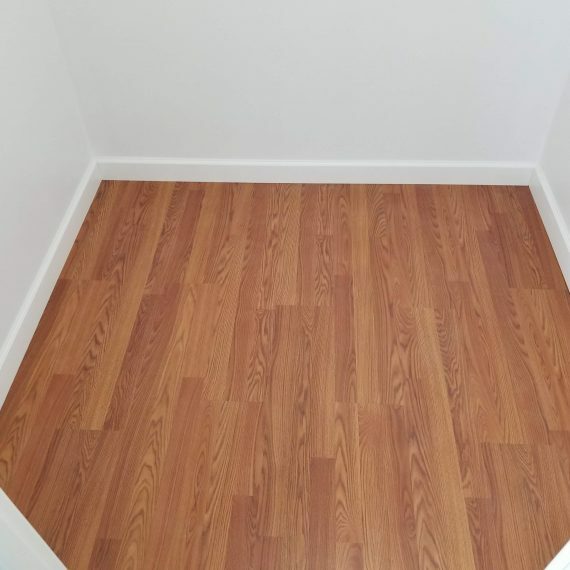 The final room for the upstairs was completed with hardwood floor and new baseboards. 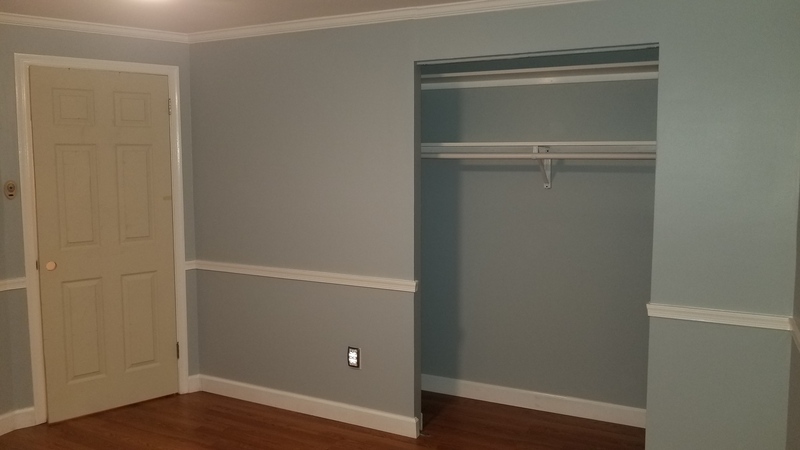 The stairway walls received a new coat of paint with the upstairs and downstairs walls color. 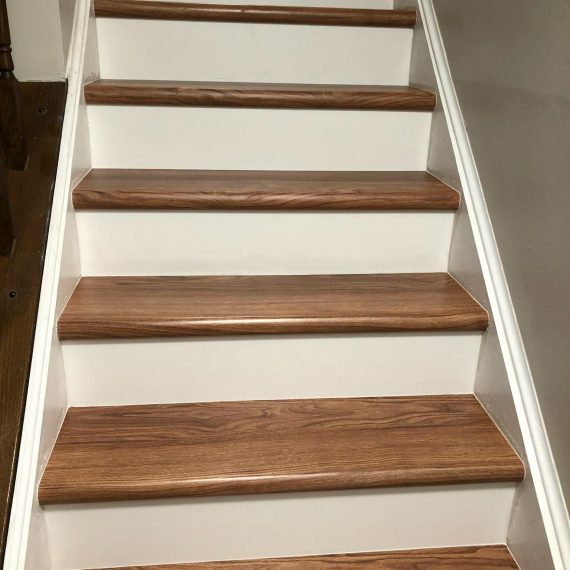 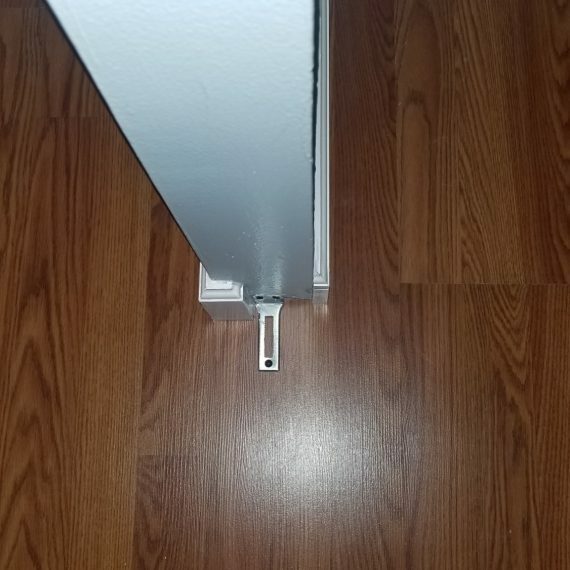 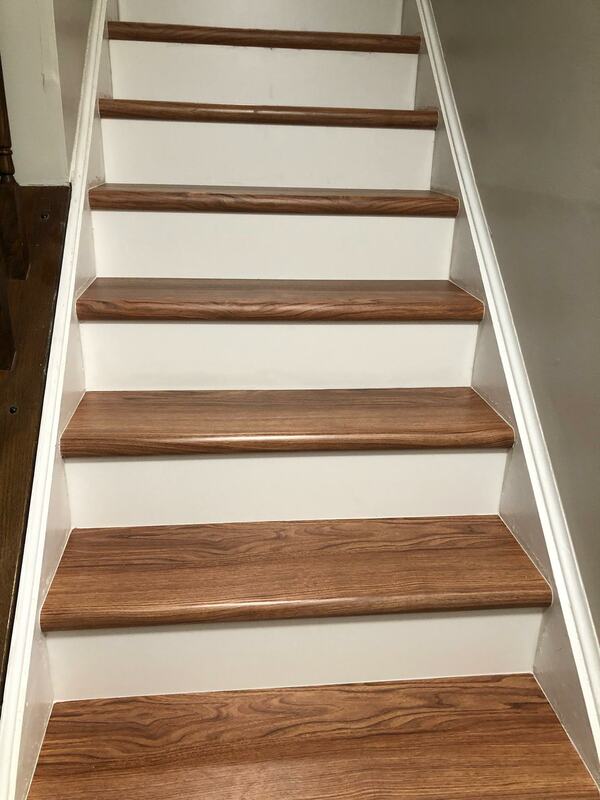 Matching hardwood steps were installed to match the hardwood flooring. 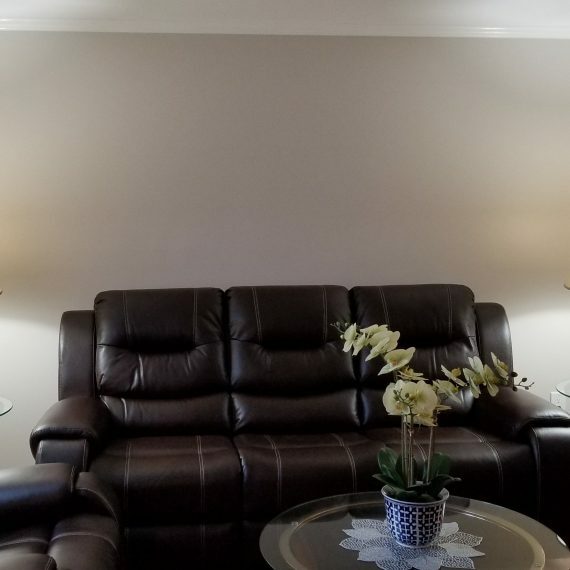 For a floor to ceiling view click on the image.